Update 28.06.2017: I just rang Glen helen Homestead and was told the 145klm road from Glen Helen to Kings Canyon part of the Mereenie Loop is still not sealed and is a dirt road still. Other areas upgrades have been made appartently. Content Alice Springs News: The government has not sealed the mere six kilometers from the loop road to Gosse’s Bluff / Tnorala (at top, and below), limiting the track to 4WD, and shutting out anyone in a 2WD as well as anyone towing a caravan, the categories dominant in the vehicles we saw on the loop, from one of the pearls in our tourism crown, and one of the reasons for completing the loop seal. SO the outer Mereenie Loop the one we use in the 4wd industry is still unsealed. best to check with the Alice Springs Vistor information Centre when you wish to go. The Mereenie Loop provides for an alternative scenic route from Alice Springs to Watarrka (Kings Caynon) and Uluru (Ayers Rock) via the Western Macs. The loop is recommended for 4x4 as weather conditions make the road conditions difficult for standard vehicles. Fuel is available at Glen Helen, Hermannsburg, Kings Creek Station, Ayers Rock Resort. If you are travelling west from Alice Springs, the unsealed dirt road called 'Mereenie Loop Road' links the West MacDonnell Ranges of central Australia with Hermannsburg, also Palm Valley and Glen Helen with the Watarrka National Park and offers an a true outback scenic route for self drive four wheel drive rentals and 4wd camper hire from Alice Springs. The condition of Mereenie Loop Road surface is dirt and unsealed is seasonal with flash flooding with access sometimes limited due to weather and traffic. Caravans, 2wd cars vehicles and 2wd trailers are not recommended. A 4wd vehicle is essential for self drive hires travelling to Palm Valley and Gosse Bluff from Alice Springs. It is advisable to contact the Police +61 (0) 8-8951 8888) to obtain current conditions and information on road before commencing. 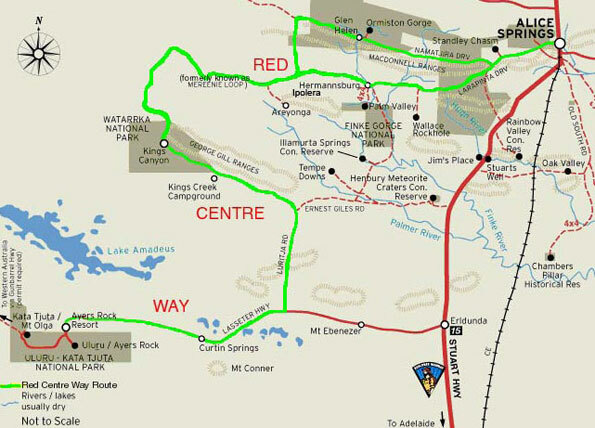 A permit is required to travel the Mereenie Loop and can be purchased from The Visitor Centre, Glen Helen Resort, Hermannsburg Petrol Station and Kings Canyon Resort. Photo courtesy - Tourism NT. Where do I purchase a Meerenie Loop Permit and how much is it? Permits to be purchased in person. The traditional land owners of Uluru-Kata Tjuta National Park, are direct descendants of the beings who created our lands during the Tjukurpa (Creation Time). We have always been here. We call ourselves Anangu, and would like you to use that term for us. Uluru-Kata Tjuta National Park is a world-class visitor destination and a key part of Australia's iconic Red Centre. This living cultural landscape is the physical and metaphoric heart of Australia, and was one of the first areas to be identified as a National Landscape. Ayres rock Uluru, also referred to as Ayers Rock, is a large sandstone rock formation in the southern part of the Northern Territory, central Australia. It lies 335 km (208 mi) south west of the nearest large town, Alice Springs; 450 km (280 mi) by road. Kata Tjuta (The Olgas) and Uluru are the two major features of the Uluru - Kata Tjuta National Park. Uluru is sacred to the Pitjantjatjara and Yankunytjatjara, the Aboriginal people of the area. It has many springs, waterholes, rock caves and ancient paintings. Uluru is listed as a World Heritage Site. The local Pitjantjatjara people call the landmark Uluru . This word has no particular meaning in their dialect, also known as Pitjantjatjara, but it is also used as a local family name by the senior Traditional Owners of Uluru. On 19 July 1873, the surveyor William Gosse visited Uluru and named it Ayers Rock in honour of the then-Chief Secretary of South Australia, Sir Henry Ayers. Since then, both names have been used, although Ayers Rock was the most common name used by outsiders until recently. In 1993, a dual naming policy was adopted that allowed official names that consist of both the traditional Aboriginal name and the English name. On 15 December 1993, it was renamed "Ayers Rock/Uluru" and became the first officially dual-named feature in the Northern Territory. The order of the dual names was officially reversed to "Uluru/Ayers Rock" on 6 November 2002 following a request from the Regional Tourism Association in Alice Springs. Uluru is one of Australia's most recognisable natural icons. The world-renowned sandstone formation stands 348 m (1,142 ft) high (863 m/2,831 ft above sea level) with most of its bulk below the ground, and measures 9.4 km (5.8 mi) in circumference. Uluru is notable for appearing to change colour as the different light strikes it at different times of the day and year, with sunset a particularly remarkable sight when it briefly glows red. Although rainfall is uncommon in this semiarid area, during wet periods the rock acquires a silvery-grey colour, with streaks of black algae forming on the areas that serve as channels for water flow. Uluru is an inselberg, literally "island mountain", an isolated remnant left after the slow erosion of an original mountain range. Uluru is also often referred to as a monolith, although this is a somewhat ambiguous term because of its multiple meanings, and thus a word generally avoided by geologists. The strata at Uluru are nearly vertical, dipping to the south west at 85°, and have an exposed thickness of at least 2,400 m (7,900 ft). The strata dip below the surrounding plain and no doubt extend well beyond Uluru in the subsurface, but the extent is not known. The route runs initially along a minor loop encompassing Larapinta and Namatjira Drives through Aboriginal land-holdings from Alice Springs on to Glen Helen or Hermannsburg, thereafter becoming a single road progressing on to Kings Canyon. From there Luritja Road runs down to join up with the Lasseter Highway, feeding off the Stuart Highway at Erldunda and on to Uluru. The route passes through some of the Northern Territory’s most spectacular countryside, and also offers an alternate route for visitors travelling to and from Uluru and Alice Springs. 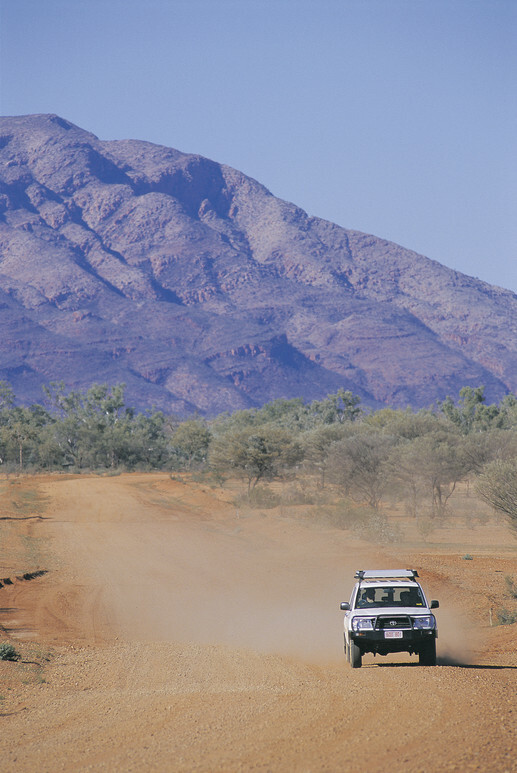 The Mereenie Loop Road is an unsealed road for 197km of 337km, a 4WD is required. This drive is one that memories are made off and photo's will fill your home with. Imagine the 4 great Central Australian icons areas all in one trip being Alice Springs, Kings Canyon, Kata Tjuta (formerley known as The Olgas) and Uluru (formerley known as Ayers Rock) . The Red Centre Way is the gateway to an abundance of natural and aboriginal attractions through the ancient heart of the Australian outback. Allow a minimum of 5 to 7 days for this journey through red desert sands, spinifex and mulga forest. Alice Springs to Glen Helen, 130 kms. Glen Helen to Kings Canyon, 260 kms. Kings Canyon to Uluru, 300 kms. Continue experiencing Uluru and Kata Tjuta. The Loop will take you through areas where ten distinct Aboriginal languages are spoken. Also, a permit is required to travel on the Loop. You can obtain them from the Central Land Council in Alice Springs ( 8953 4345), Glen Helen Resort, Hermannsburg Petrol Station and Kings Canyon Resort. The permit costs just $5. Regardless of where you stay while you're at Voyages Ayers Rock Resort, from the sanctuary of one of the five hotels, or the intimacy of Voyages Ayers Rock Resort Campground, you can experience the beauty of the living cultural landscape of Uluru-Kata Tjuta National Park, in Australia's Northern Territory. 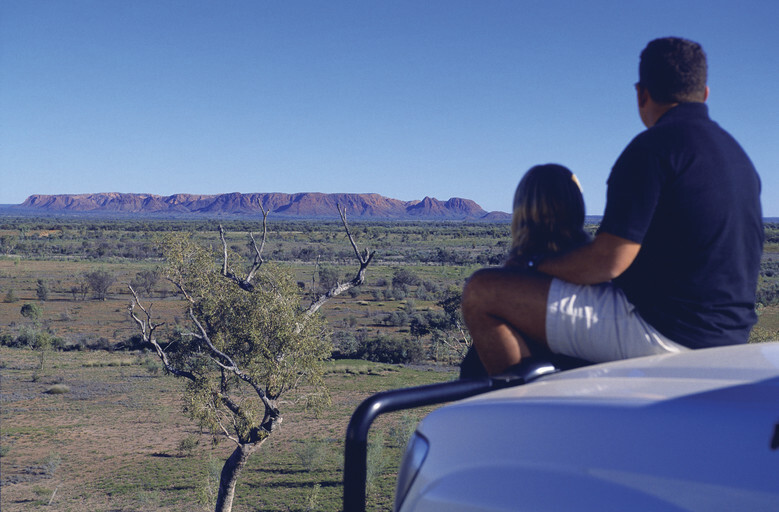 With over 65 tours, local activities and attractions within the Resort and the Uluru-Kata Tjuta National Park, your days will be action-packed. Ride a camel across the desert dunes. Hop on a Harley, or embark on a base walk of Uluru (Ayers Rock). Ayers Rock Resort Airport Fly direct to the heart of Australia ... You can fly daily from Perth, Sydney, Cairns and Alice Springs direct to Ayers Rock Airport. Direct flights operate twice a week from Melbourne. Flights from Darwin and Brisbane connect from Alice Springs through to Ayers Rock Airport. Ayers Rock Airport is conveniently located just six kilometres from Voyages Ayers Rock Resort (10 minutes' travel). The airport services both fixed and rotary winged aircraft and receives up to on average 350,000 - 400,000 commercial passengers per year. It's also a popular stopping off point for private pilots and passengers travelling in their own aircraft. From Ayers Rock Airport, you can enjoy scenic desert flights over Uluru and Kata Tjuta. You will find hire car companies, tour desks, a Qantas desk, Ayers Rock Design retail outlet, and an information desk at the airport. Kata Tjuta (The Olgas)Both Uluru and Kata Tjuta have great cultural significance for the Anangu Traditional landowners, who lead walking tours to inform visitors about the local flora and fauna, bush foods and the Aboriginal dreamtime stories of the area. Kata Tjuta, also called Mount Olga or The Olgas owing to its peculiar formation, is another rock formation about 25 km (16 mi) from Uluru. Special viewing areas with road access and parking have been constructed to give tourists the best views of both sites at dawn and dusk. The rock was originally sand, deposited as part of an extensive alluvial fan that extended out from the ancestors of the Musgrave, Mann and Petermann Ranges to the south and west, but separate from a nearby fan that deposited the sand, pebbles and cobbles that now make up Kata Tjuta. The similar mineral composition of the Mutitjulu Arkose and the granite ranges to the south is now explained. Voyages Kings Canyon Resort is located in a loop off the main highway running between Ayers Rock and Alice Springs. The sensitively designed resort is just seven kilometres from Watarrka National Park, the home of the magical sandstone formation of Kings Canyon. Due to Voyages commitment to best environmental practice, the resort has been built to blend harmoniously with the surrounds. Kings Canyon Resort offers a wide range of accommodation from the campground that enjoys the outdoor stillness of the Red Centre to deluxe spa rooms - offering understated comfort rather unexpected in such a remote location. It is the perfect oasis from which to explore the wonders of Kings Canyon including the amazing rock formation called the Lost City and the Garden of Eden an oasis of an entirely different kind at the foot of the Canyon. The flora of Kings Canyon offers a clear indication that the climate of this whole area was once vastly different. There is no better way to explore Central Australia then at your own pace. As Kings Canyon lies just 3 hours from Uluru (Ayers Rock) and approx. 4 hours from Alice Springs, self drive is a popular option. The drive passes some incredible sites including Standley Chasm, Ellery Creek and Ormiston Gorge. The Simpson Desert, southeast of Alice Springs is one of Australia's great wilderness areas containing giant red sand dunes and interesting rock formations such as Chambers Pillar and Rainbow Valley. The 223 km long Larapinta Trail follows the West MacDonnell Ranges and is considered among the world's great walking experiences. 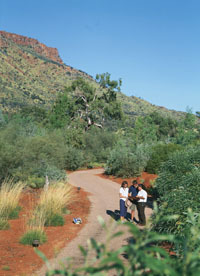 The Alice Springs Desert Park was created to educate visitors on the many facets of the surrounding desert environment. 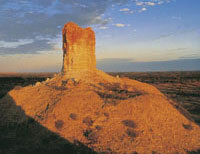 A must see for every visitor to Alice! In the space of just a few hours, you can discover many of the secrets of the Central Australian deserts at the Desert Park. Hundreds of species of plants and animals found across Central Australian deserts can be seen, smelt and heard. You will even have the opportunity to experience desert habitats as they are at night, seeing some of the animals near impossible to see in the wild. The MacDonnell Ranges run east and west of Alice Springs and contain a number of hiking trails and swimming holes such as Ormiston Gorge, Ormiston Gorge Creek, Red Bank Gorge and Glen Helen Gorge.